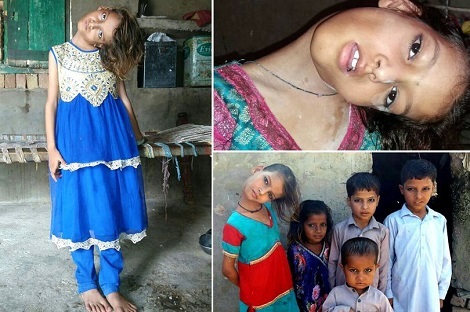 A nine-year-old girl lives in constant pain with a rare condition that means her neck is permanently bent at a 90 degree angle. 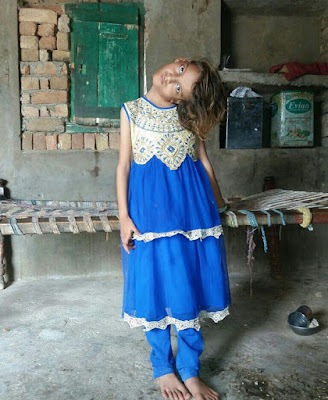 Afsheen Qumbar has a muscular disorder which means she cannot keep her head upright. She cannot stand or walk properly and is restricted to a sitting position. 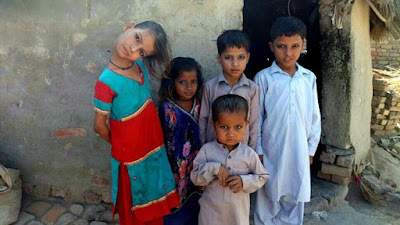 The young girl from Mithi in Pakistan's Singh province even needs help to eat and use the toilet. 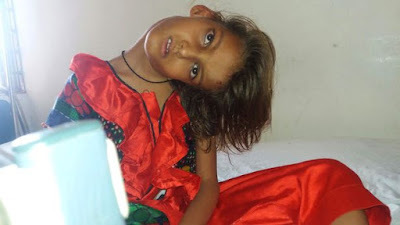 Her father Allah Jurio, 55, and mother Jameelan, 50, say they have consulted several doctors but have been told that treatment for such a condition is not available in Mithi. Jameelan said: "It is devastating to see my daughter like this. I cannot see her suffer anymore. Afsheen was born a normal baby like her six other siblings but her life changed after she reached the age of eight months. "When she was eight months old, she fell on ground while playing outside the house and got her neck hurt. "We ignored her condition initially and due to lack of money we used to take her to a local faith healer but her condition never improved. "As she grow older, her problems became complicated. She isn't able to keep her head upright at all and often complains of pain in the neck. Jurio said: "People say bad things about our daughter. They often laugh at her. It really hurts us. "We cannot tolerate people's attitudes and discrimination. "People avoid her sight so we keep her at home. We want her to study but no one will accept her in school." Doctors believe Afsheen suffers from a rare case of muscular disorder or anomaly in spine but suggest only a thorough examination can reveal the cause. Afsheen's desperate parents plead for help from the Pakistan government.